Our pranayama seminars are led by Dr. Shrikrishna Bhushan Tengshe. He was born and brought up in a culture imbued with yoga, growing up at one of the oldest Indian centers for Yoga Research and Therapy - the Kaivalyadhama Institute in Lonavla. After qualifying as a medical doctor, Dr. Shrikrishna also obtained a Ph.D. from the prestigious All India Institute of Medical Sciences (AIIMS), having conducted research on the Neurophysiological effects of Pranayama for his thesis. Subsequently, succeeding his father as Secretary and Chief Medical Officer of the Kaivalyadham Institute in Mumbai, Dr. Shrikrishna led the institute for some decades. Since his retirement he is focussing on his own practice and Sadhana and is especially devoted to the advancement of spiritual development. He instructs yoga teachers and spiritual seekers worldwide in the field of pranayama and meditation. He is official instructor of the Union of German Yoga Teachers (BDY) and author of the book "Essence of Pranayama". 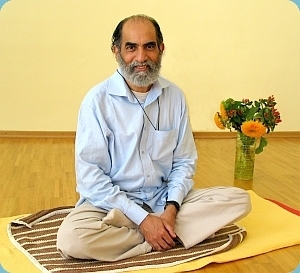 Dr. Shrikrishna is not only instructing the techniques of pranayama practice in a very precise manner, but also teaches the subtle essence of the philosophical and psychological principles of a yoga path that is based on an authentic background of the living tradition from India and which leads far beyond the mere physical practice of body-, breathing- and meditation methods. His humourous way of teaching combines mindful precision with the embodyment of deep experience. "... through the intensified and refined sensitivity as well as through the deepened awareness that evolve out of the yoga practice, one is able to lift the whole field of pranic activity into the area of consciousness, and by that we can learn to regulate these activities in the desired manner." "That leads to a complete transformation of the individual consciousness through that we can experience our own inner state as nothing else but the clear and unconditioned consciousness that is not blurred by the concepts of time and space. This is the ultimate goal of any yogic practice." "Yoga methods are not meant as an instant solution for several problems of your own life. The abilities that you can learn through this practices have to be converted to the rest of your existence and to be integrated in all other aspects of your life. This is the path, by which you can start living your life in a meaningful way."